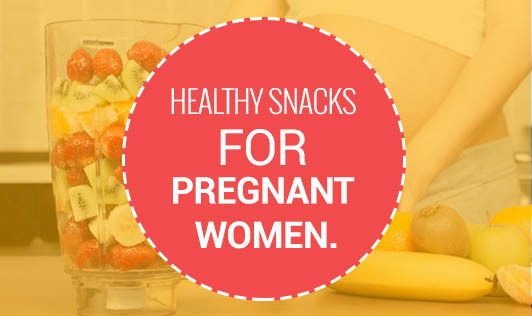 Healthy Snacks For Pregnant Women. With pregnancy, comes an evident change in your eating habits. Generally, pregnant women will need an additional 300cals per day. Depending on the specific medical condition, the doctor may ask you to take help from a dietician to make changes in your eating habits. And, snacking healthy during pregnancy is the best way to get all the nutrition you and your baby need. Eating small and frequent meals reduces queasiness in the first trimester. With advancing pregnancy, snacking helps in controlling hunger pangs. Snacking is the best way to ease out indigestion. By choosing healthy snack options, you can wisely add on to your daily required nutrition. Small, frequent snacks provide steady flow of nutrients to the growing baby inside you. Here are a few healthy snack options that will benefit you and your baby. 1. Fruits: Stock fresh chopped fruits in your refrigerator and snack on it whenever you are hungry. Avoid using sugary syrup, jaggery or honey. 2. Salads: Carrots, cucumbers, tomatoes, beetroots, raisins and nuts. All these ingredients make an excellent salad. 3. Sprouts: Stock a variety of sprouted legumes. It is a filling snack with a protein and calcium boost. 4. Yogurt: A complete nutritious snack that provides upto 25% of daily calcium requirement and several other nutrients. 5. Fruit smoothies and milk shakes: Highly nutritious and a perfect alternative to an ice cream. 6. Paneer with vegetable or chicken sandwich with a banana: A complete meal by itself. 7. Mixture of non-sugary cereals with nuts and raisins: Keep this mixture stored in a jar. It is ready to eat when you are hungry at odd times. 8. Whole grain biscuits: Easy to carry at work or during long rides. Make your snacking interesting and healthy by consulting with your dietician.